Scientists from the Institute of Physics together with colleagues from Utrecht University developed a new method to image the electrostatic field of molecules at the atomic level. The work, which was published in the prestigious journal Nature Communications , advances our current possibilities to image individual molecules on a solid surface using atomic force microscopy (AFM) and scanning tunnelling microscopy (STM). The new method can determine the electrostatic field on a single molecule from distortions of high-resolution images acquired with scanning probes. In this particular case, the outermost atom/molecule of the probe is significantly displaced during scanning by the electrostatic field of the probed molecules, very similar to an arm of the classical electroscope. Consequently, the movement of the front atom on the probe induces the distortions of the positions of atoms and bonds seen in the high-resolution images taken by means of AFM, like the deformation of images of stars and galaxies in astronomical photographs due to the strong gravitational field (i.e. the Einstein gravitational lensing). The authors of this study have developed the method employing the degree of the reconstructing the electrostatic field in the vicinity of the investigated molecules. The method provides the significant advantages over an older technique, so called Kelvin probe force microscopy, improving substantially the spatial resolution of the detected electrostatic field. Moreover, the method enables to obtain simultaneously the electrostatic field together with information on the chemical structure of the inspected molecule. What more, the principle of the method may be utilized in the future for mapping other force fields around molecules, such as magnetic fields. The utilization of the probe with the flexible terminal atom/molecule has been already known for a certain period. For example, this method enabled for the first time a directly observation of the chemical structure of individual molecules. Nevertheless, the Czech team of scientists has pointed out the key role of the deflecting probe and its direct relationship to the electrostatic interaction for the understanding AFM / STM images [2,3]. The new work  shows how the distribution of the electrostatic field can be obtained from a relatively simple way. The electrostatic field around molecules largely determines its behaviour, e.g. it affects preferred sites within the molecule, where chemical reactions can take a place with other compounds. This field is also crucial to understand self-assembling processes of individual molecules forming e.g. supramolecules (e.g. DNA). These molecules are of the great importance in biology and organic chemistry. Thus the direct detection of the electrostatic field opens up new possibilities in the field of material science, physics, chemistry, biology and nanotechnology. Mapping the electrostatic force field of single molecules from high-resolution scanning probe images. Nat. Comm. 7, 11560 (2016). Submolecular Resolution Imaging of Molecules by Atomic Force Microscopy: The Influence of the Electrostatic Force. Phys. Rev. Lett. 116, 096102 (2016). 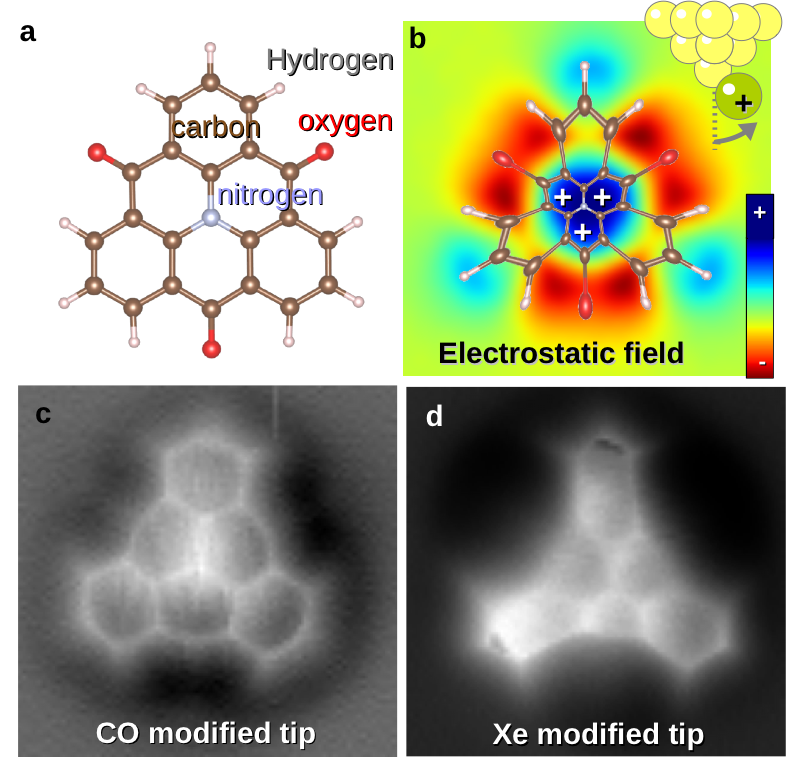 Origin of High-Resolution IETS-STM Images of Organic Molecules with Functionalized Tips. Phys. Rev. Lett. 115, 079903 (2014). Figure a) The atomic structure of 1,5,9-trioxo-13-azatriangulene (TOAT) molecules . Central nitrogen and peripheral oxygens create a strong electric field in the molecule. b) the electrostatic field of TOAT molecule deflects a flexible frontier atom/molecule located at the end of the probe (xenon atoms - Xe or molecule of carbon monoxide - CO), making different parts of the molecule seemingly enlarged, reduced or moved. c) The image of the TOAT molecule taken with a probe of atomic force microscope, which has located a CO molecule. The image is almost distortion-free thanks to a small electrostatic charge of the CO terminated prober. d) The same TOAT molecule inspected by a probe terminated by only one atom Xe. The center of TOAT molecules is significantly reduced due a strong repulsion of a positively charged atom Xe from the nitrogen due to the positive charge in this region.